Offers customers easy access to food without leaving home. Great money-making opportunity to supplement income. Gives flexibility in setting your working hours. User-friendly, intuitive, and easy to setup. The DoorDash delivery app works a little differently than the other ones in this article. When an order is placed, the DoorDash app will work by pinging drivers in the area of the restaurant ordered from. The app will then calculate the distance of all points involved including the driver’s current location, the restaurant’s location and where the customer ordered from. Once the DoorDash driver arrives at the restaurant, they will have one of three options to choose from. Similar to the many rideshare apps, the on-demand food delivery app market is steadily growing. Because this innovative, new market is just in its infant phase, the jury is still out on which app offers the best deals and services. However, while it is still unclear who the dominating rideshare giant is, many students, freelancers and side-hustlers and all those in between have used these unique job opportunities to make part-time and full-time incomes to support themselves and their families. The on-demand food delivery services are very similar to the ridesharing services because they allow people to work at their own pace, set their own working hours and make a decent living as independent contractors. Who doesn’t like being their own boss? What Do These New Food Delivery Services Mean For Traditional Industries? From Restaurant To Your Dinner Table- How Do These Food Delivery Service Apps Work? On-Demand Food Delivery Service Apps- Legit? Can You Order Alcoholic Beverages Through These Apps? How to become a Grubhub driver? How to work for Grubhub? How much does Grubhub cost? How to cancel Grubhub order? Is Grubhub in my area? How much does Grubhub charge for delivery? How to sign up for Grubhub? How much does Grubhub charge restaurants? Does Grubhub tip go to driver? How does Grubhub work for restaurants? When does Grubhub stop delivering? How does UberEATS work for drivers? Do you tip on UberEATS? How do UberEATS drivers get paid? How much is UberEATS delivery fee? How much does UberEATS charge restaurants? How to delete UberEATS account? How much do UberEATS drivers make? How to cancel UberEATS order? How to tip on UberEATS? What time does UberEATS close? How to apply for UberEATS? Is UberEATS in my area? How old do you have to be to do UberEATS? What is UberEATS booking fee? Do UberEATS drivers get tips? What time does DoorDash start delivering? How much does DoorDash cost? How to sign up for DoorDash? What time does DoorDash stop delivering? How to work for DoorDash? How to become a DoorDash driver? How do DoorDash drivers get paid? How much can you make with DoorDash? Do DoorDash drivers see tip? How do I delete my DoorDash account? Does DoorDash deliver to me? Do you tip DoorDash drivers? How much does Postmates pay? How to work for Postmates? How to tip on Postmates? Do you tip Postmates drivers? Does Postmates deliver to me? How to sign up for Postmates? Owners of local restaurants are still going to be expected to deliver food. Technology companies are still going to be designing new products to run faster and more efficiently. All industries are going to continue to grow and evolve with the times. To stay successful, businesses need to balance the growing and ever-changing needs of their customers and clients. However, when it boils down to the bottom, everyone will still need to gather up their W2s and pay their taxes. The top four food and beverage delivery apps available today are Doordash, UberEATS, Postmates and Grubhub. For anyone looking to order from their favorite restaurants without leaving their home, these are the apps to try. The hardest part in getting started is figuring out which one is best to use. This complete review is meant to serve as a simple guideline for anyone in the freelancing community, foodservice industry, app designing community and everyone in between to examine and gain a better understanding of the human element of this extremely on-demand and economic technology. It should be noted this guide is not meant to be biased. It is simply a complete comparison between the top four rated delivery apps for anyone interested in learning more about each and being able to compare them to each other. This will help individuals find the right part-time employer or right food service delivery app. Restaurant managers may also use this guide as a tool to meet their customer’s needs and know what they are looking for in food service delivery jobs or for when their hunger strikes. It does not matter which of these apps you choose to order food from or try as a part-time job. GrubHub, DoorDash, PostMates and UberEATS all have the same goals for their customers. The goal is to get food from point A to point B and is expected to arrive at its destination with the same quality and taste customers would expect if they were to have ordered the same meal at the restaurant. Each food delivery app will have their own logistics to follow with regards to getting the food from point A to B. If you were to start your own food service delivery company, you would also need to take into consideration the budget and scope of your company before you could realistically offer this service to your customers. Like stated above, all delivery service applications run a little differently. With Postmates, each driver is given a corporate debit card to carry with them while working. This card is used to pay for their customer’s meals on their behalf. For most of the company’s drivers, the debit card is a Postmates-brand card. Each card contains an alphanumeric identification number that is unique to the driver. For drivers who have been working for Postmates for a while or who have been actively working, they will earn a card with their name on it. These cards can be used for non-food items that are ordered such as a delivery of electronics from an Apple Store. Each time an order is placed, the driver will get money preloaded onto their personal Postmates debit card. Generally, the amount that is preloaded is a rounded-up amount based on the customer’s purchase total. For example, if a customer orders a meal from a restaurant and the total comes to $27.99, the Postmate driver’s debit card will get preloaded with $40. The reason behind the amount getting rounded up is to help give the drivers a bit more flexibility in the event something about the order changes. They will have a little extra money if the customer decides to add to the order or if the prices at the restaurant differ from the online amount when the customer placed the order. If the customer makes changes that put the total above the rounded-up amount the driver received, the driver will be able to request extra funds through their Postmates app to cover the difference. In the beginning, Postmates had restricted the debit card usage of their drivers to a designated location based on GPS readings. This was to help control the amount of abuse and fraud in the system. Unfortunately, these restrictions caused more problems than they solved. The GPS locations were too slow to update or were often inaccurate. The app used to have a feature that would allow the customer to order the food themselves. An estimated time the customer’s food would be done and ready to be picked up was then sent to a designated driver. This allowed drivers the ability to offer ridesharing to customers in-between food deliveries for extra cash. This feature was not always reliable and was removed, unfortunately. Owners of restaurants are able to use a reliable third-party API to offer their customers the ability to use the Postmates delivery service to order food. Using this format, customers of restaurants fail to recognize the Postmates drivers are independent contractors and not working as employees for the restaurant they ordered from. Some Postmates drivers have shown frustration over customers’ tips being given to the restaurant and not to them as the driver. New features to help fix this problem are currently in process. The UberEATS app uses a very simple format. Each time an order is made, it is prepaid for. The order will also be made well before the driver arrives to pick it up. In reality, the UberEATS app allows a customer to place their order through the app. The order is then picked up by the driver. The meal is supposed to be ready to be picked up by the driver before they arrive. However, this is not always the case. Many times, drivers are forced to wait around until the order is prepared. While this may not always be the best case scenario for the drivers, it is done to ensure a meal is fresh and hot when delivered to the customer. For other delivery service apps, the drivers are supposed to check the order before leaving the restaurant to ensure it is what the customer ordered. With UberEATS, however, they have what is referred to as their “closed-bag” philosophy. No driver is allowed to inspect the meals before delivering them. The order is handed to the driver and not opened until it reaches the intended customer. This is done to absolve an UberEATS driver from the responsibility of checking to make sure an order is correct or not missing anything. The responsibility lies on the customers checking their order and the restaurant for filling it correctly. The Grubhub app is a bit different than the rest because it isn’t exactly a food delivery service. It has, however, merged together with other services such as Yelp’s Eat24 and Seamless. Grubhub got its start back in 2004. It was originally just an online alternative to paper menus. It allowed restaurants and companies to build relationships and successful partnerships with each other. Not all restaurants have their own delivery service. For these restaurants that don’t have full-time drivers employed, they could use Grubhubs’ fleet of independently contracted drivers. This is similar to how Postmates, Doordash and UberEATS work. The idea is to have an order placed by a customer first. The Grubhub driver is then to show up at the restaurant when the food order is being completed. The meal is put in a sealed, branded Grubhub bag to ensure hot and fresh delivery. The technology Grubhub uses allows both customers and restaurants the ability to track the delivery of the orders. This helps offer customers an estimate on when their order should be arriving. Driving for Grubhub has many benefits. As a driver, you can choose to schedule yourself to work in “blocks” of time. This is similar to a traditional job. The block time you choose is essentially the timeframe you are willing to accept deliveries. A driver is able to work outside of this block time if they choose to. However, Grubhub will prioritize orders to go first to scheduled drivers. The more time a Grubhub driver schedules themselves to work, the more work they will be given and have the potential to earn more. 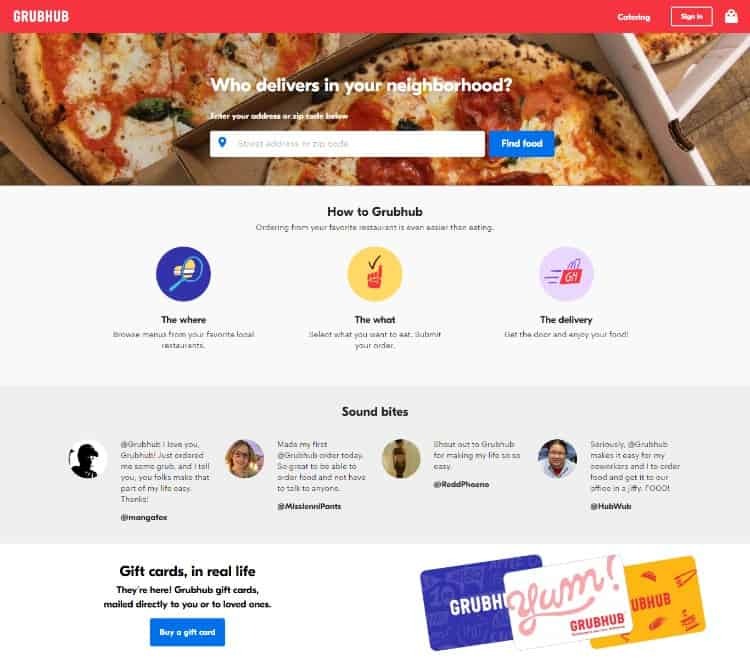 Grubhub drivers who work outside of their scheduled blocks will have to wait to see if any orders are not assigned to others. Any delivery not assigned to a scheduled driver can be picked up by anyone in the area. According to a driver’s Program Level, they may pick up blocks of work whenever they want. They may also choose to drop a scheduled block beforehand if they cannot or do not want to work it anymore. One of the best parts of being a driver is the ability to have flexibility with your schedule. For all of the delivery app positions, the drivers are paid via direct deposit to their bank account. This is a pretty standard method of payment across this industry. There are some problems with the timeliness of payments in some cases. Postmates will pay their drivers for deliveries four days after a transaction has been completed. For drivers who receive tips from customers, the transaction may be delayed even longer. This is not always a bad thing, except for when drivers are charged a 15 cent fee every time they get their money sent to their bank account via direct deposit. Most Postmates drivers complain about the fees. While the 15 cents doesn’t seem like much, it can add up when it is taken off of each tip. It is important to note that the fee is charged by the payment processor and not Postmates. It is illegal for a company to impose direct deposit fees for payments. This fee is called the “stripe fee” and is not a popular payment option. Doordash, Grubhub and UberEATS pay their drivers weekly on different days by direct deposit. UberEATS also offers the option for drivers to cash out payments on any day they choose. However, there is a dollar fee imposed each time this option is chosen. Doordash also has their own daily payment option for drivers. For all apps, customers are required to pay for their order through the app. Grubhub accepts different payment forms such as Apple Pay, eGift cards, Android Pay, Paypal and cash. Drivers who work with the apps that pay for mileage get it calculated and paid “as the bird flies.” This means the mileage is calculated in a straight line from restaurant to the customer’s drop-off location. The mileage calculated does not take into account turns, etc. Tipping for these types of services can be a bit confusing for the customers. While the method of delivery has been evolving, the etiquette for tipping remains largely the same. Good service usually equates to at least a 20 percent tip on the order. Customers who order from UberEATS have up to a month after their order was delivered to send a thank-you tip. Postmates uses a tipping system that is completely cashless. They ask that drivers only be tipped through their app. A customer may simply choose how much they want to tip on top of the total. Tipping for the on-demand Grubhub service can be done through their app as well. Many drivers have complained that some customers will choose to tip in person and then stiff the driver completely. With Doordash, the app requests tips to be given before their food even arrives. This is done to present a driver beforehand a “guaranteed amount” in earnings before accepting the task. The amount combines the base delivery pay, the mileage and the expected tip together. Oftentimes, Doordash drivers will check their earnings after a delivery and notice it is for more than the estimate they were originally given. Most drivers would agree that Postmates is the most unique of all the choices. The corporate credit card sets the company apart from the competitors. Doordash works hard to ensure that all drivers make a decent amount of money delivering without having to rely on tips. UberEATS is more synced with the large-scale ridesharing aspect of the Uber company. This makes the earnings potential for Uber drivers much higher. They can break up their day by adding in food deliveries between ridesharing jobs. As of last year, Grubhub was the king of the pack, mostly because of their partnerships with other brands and services. Smaller companies might fare better choosing a delivery service such as Doordash to work with. Doordash offers awareness and a more positive association with the food and products they deliver. They put more emphasis on quality. Larger companies will probably fare well with Postmates because they won’t see the corporate credit cards as burdens on their budgets. Each of the top four on-demand services is more than capable of offering reliable food delivery. The most important thing to both customers and drivers is the innovations and features that make the service they use to stand out enough to earn a decent wage and be a respectable position to work and earn a living doing. Independent contractors do not get the same benefits that traditional jobs offer their employees. There are no perks such as health insurance or 401K plans. However, this does not mean that the delivery service companies leave their drivers without their own kind of perks. UberEATS offers rewards to their drivers in the form of free gas, assistance with finances and finding health insurance, discounts on phone plans and more. Doordash offers their drivers the ability to purchase commercial insurance plans. However, they have to maintain their own personal policies. UberEATS and Doordash have partnered with a company called Stride. They work with drivers to help them purchase their own health insurance plans. Doordash also has a partnership with Everlance to help their drivers track their expenses to help with tax time. Postmates offer rewards and discounts to their drivers once they complete their 10th and 25th deliveries each month. Drivers also have access to supplemental health insurance policies. Customers who are new to UberEATS will usually get a decent discount off of their very first order. They may also receive promotions offering free products from partners of Uber. Drivers can refer their friends to the app and receive bonuses if they become drivers and complete a set amount of trips. Many people love to enjoy a glass of wine or a cold beer with their meal. Some of the services offer alcohol deliveries. Postmates, Grubhub and Doordash offer delivery in specific markets around the country. UberEATS only allows delivery of alcohol to a handful of locations around the world. Doordash has an ordering process for delivering alcohol which requires the verification of a customer’s identification beforehand. Drivers are not allowed to deliver alcohol to anyone who seems visibly intoxicated or who might be giving alcohol to a minor. There is no clear winner for on-demand food delivery applications. 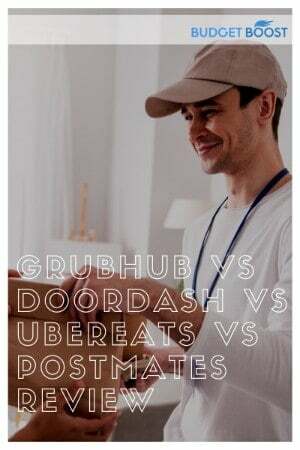 Postmates, UberEATS, Doordash and Grubhub all have their own pros and cons. Choosing which app to use for deliveries or which company to work for comes down largely to personal preference. It may take some time and experimentation to find the right one for you. It will be interesting, however, to see how each of these services continues to grow, innovate and improve in the coming years. New services might come out of the shadows that beat all of these current apps. Only time will tell who comes out on top. Food delivery platforms have become a popular way to get items from your favorite restaurants without leaving the comfort of your own home. There are several delivery platforms available in cities across the United States, and there are some that are even available in various countries. Below we’ve answered some important questions about the most popular food delivery platforms available, and given some information on the pros and cons that come with using them. Grubhub is a platform that serves as both a website and an app through which you can order food from restaurants in your area. Grubhub’s availability is based on the hours of operation for the restaurants that are a part of the service. Below we’ve answered several questions about Grubhub and provided information for people who are curious about using the platform and who wish to work as a Grubhub driver. Grubhub is a web commerce platform and app that allows you to order food and have it delivered straight to your door. You can order from over 50,000 restaurants depending on their availability. Grubhub serves as a link between a customer and the restaurant. Through Grubhub, you choose what you want and from which restaurant, then Grubhub charges you to have a delivery driver pick up your meal and deliver it straight to you. To become a Grubhub driver, you must meet certain requirements, such as being 19 years of age or older, driving experience of 2 years, and have an iOS 8 iPhone or Android with 4.0 or higher. You then must sign up and wait to be approved. On average, the typical Grubhub driver makes a salary of $12 an hour. The rate can range greatly though, from anything to as low as $5 to as high as $25 an hour. To work for Grubhub, you just need to sign up through the Grubhub website and provide your information. Once Grubhub approves your application, you can take orders through the Grubhub app. You do have the opportunity to tip through Grubhub. Not only does Grubhub encourage you to tip, but it also gives you an option to tip through the app or choose that you plan to tip the driver with cash when they arrive. Grubhub makes money by charging restaurants a percentage of the transactions that are made through the Grubhub platform. If a company pays a higher commission rate, they appear higher in searches. Grubhub primarily takes payment from major credit cards or through other services, such as PayPal and Venmo. You can pay in cash, but it is dependent on the restaurant you order from. Grubhub does have its own delivery drivers. To have Grubhub deliver, you must provide your address and pay a delivery fee to have your meal picked up and sent straight to your door. You’re also encouraged to provide a tip for excellent service. Using the Grubhub app or platform is free, but you will have to pay for the food that you order. You will also have to pay a fee for delivery, which is often set by the restaurant. To cancel an order from Grubhub, sign into the app or the website and go to the Orders icon. Choose the order you want to adjust or change and then select cancel. Provide some information or reasoning for canceling the order and then end it. Grubhub does take PayPal as a form of payment. It should be noted that some payment methods aren’t available based on the browser you’re using or if you’re using the web platform or app. Grubhub is a safe service. Grubhub primarily serves as a go-between for customers and restaurants. Whether you’re a customer or driver, Grubhub is a legitimate platform where your information is safe. You can find out whether Grubhub is in your area by visiting the website and entering your address. Grubhub will then tell you what restaurants are available that use its services. As a service, Grubhub can be worth it because of the convenience that it provides. For delivery drivers, it can be worth it as Grubhub not only allows you to set your own hours, but you can make an average salary of $12 an hour. Grubhub charges a delivery fee for your purchases. The price ranges depending on the distance of the delivery and a few other factors. In some situations, such as when using Grubhub for Work, there is a $9.99 delivery fee. To sign up for Grubhub, you need to download the app or sign up through the Grubhub website. Through either method, you’re must download the app at some point and provide some information. Grubhub charges restaurants depending on various factors. On average, Grubhub charges restaurants a 13.5% on commissions. The commission is charged for each order made on the platform. To use Grubhub, you need to download the app and sign up for the service. Once you’ve signed up for the service, you can order from the available restaurants and have the food delivered to your door. The tip for Grubhub does go to the driver. Grubhub suggests either a $5 tip or a 20% tip, whichever is more. You can either tip through the app or tip in cash. Grubhub charges restaurants around 13.5% on commissions for each order made on the platform. The restaurants make money for the orders made on Grubhub and then pay a percentage of that to Grubhub in return. Grubhub issues payments on Thursday and it can take 3 – 5 days for banks to process the payment. You should receive payment by Monday at the latest. You can also get paid via check once a month. Grubhub pays through two methods, based on the driver’s choice. You can either get paid on Thursday through direct deposit at the cost of a $1 transaction fee. You can also get paid once a month via check. Grubhub offers 24-hour delivery every day of the week. Grubhub delivery hours are based on the availability of the restaurants in your area. If there are 24-hour restaurants in your area, you can order from them through Grubhub. Grubhub is a legitimate company and service. You can earn an income by becoming a delivery driver for Grubhub, but your experience and earnings are subject to change based on varying factors. A companion to the popular Uber platform. UberEATS connects users with Uber drivers who work to deliver food straight to your door. UberEATS has several restaurants available and it is available 24 hours a day, seven days a week. Take a look at the questions we’ve answered below about UberEATS and how to use it if you’re looking to try it as a food delivery service app for your convenience. UberEATS is a food delivery app that works similarly to Uber. Your delivery driver picks up the food for you and delivers it to you. All the financial transactions are handled through the app so you don’t have to exchange cash. UberEATS is a food delivery app. Through the app, you order food from one of the restaurants available and then a delivery driver picks up the food, after you’ve purchased it, and delivers it straight to your door. The price for UberEATS varies based on a few factors. Every order you make is determined by how much the food costs, the UberEATS booking fee, and any taxes that may apply. The delivery is usually around $4.99 for an order. UberEATS does not take cash, except for in select countries. If you aren’t sure if your UberEATS account can take cash, you can find out by seeing if the option is available when trying to order through the app. To use UberEATS, open the app on your smartphone or mobile device and sign into your Uber account. Once you’ve set a delivery address and a restaurant in your area, you can choose an item from the menu, add them to the cart, and then place your order. Delivery drivers for UberEATS are paid every time they drop off an order at a customer’s place. Payments are processed directly from the app and drivers are paid regularly. Drivers can even receive tips from customers. You can tip your delivery driver on UberEATS. The app gives you the opportunity to add a tip every time you make an order. You can also leave a tip with your driver in cash once they’ve arrived with the food you’ve ordered. UberEATS pays on a sliding scale. A delivery driver can earn more during lunch and dinner rushes compared to other times. On average, an UberEATS driver should expect to make around $8 – $12 an hour after considering vehicle expenses. Initially, the UberEATS delivery fee was a flat $4.99. Now, the delivery fee is determined on distance. Fees are cheaper the closer the customer is to the restaurant. You may also have to pay an additional fee based on how much you’ve ordered. UberEATS charges restaurants in two ways. The first way is through marketing by placing the restaurant on a promoted listing. The second is through revenue share where UberEATS charges 30% for every order made on the app. Sign into your Uber account through your Uber app and go to the Settings section. Afterward, choose the “Privacy Settings” and tap the “Delete Account” option. Follow the prompts and you will delete your account on Uber. UberEATS drivers work on a sliding pay scale. The amount they earn increases during lunch and dinner rushes. The amount also increases during various surge periods. On average, an UberEATS driver can make around $10 an hour. After you’ve placed your order, you can cancel through the app by tapping the “Cancel Order” button on the order tracking screen. You can only cancel the order from the app before the restaurant accepts it. If you want to cancel after that, you must contact the UberEATS customer support team. When you’re placing an order on UberEATS, you have the option to tip your delivery driver after you’ve received your food. You have up to 7 days after receiving your delivery to give a tip, you can then select a preset amount. UberEATS adds a level of convenience to your food delivery service. 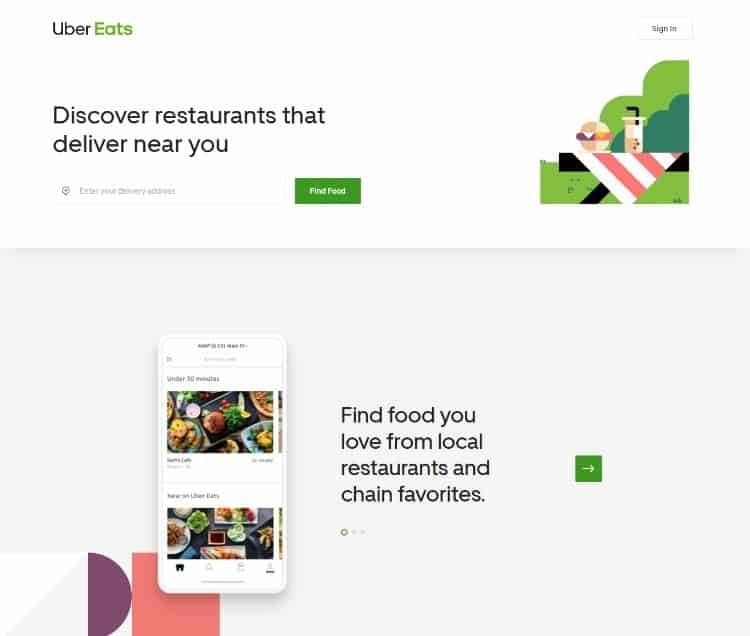 Unlike ordering food from specific restaurants, UberEATS gives you a long list of places to choose from so that you have any number of options when you’re feeling hungry, but the pricing makes it difficult for many people. UberEATS does now allow you to receive alcohol through their service. You will have to purchase a meal alongside the alcohol you purchase, but you can get anything from a bottle of wine to a six-pack of beer delivered to you. You can use UberEATS at any time if the restaurant you want to order from is open. While it is determined on the availability of the restaurant, UberEATS is open 24 hours a day, 7 days a week. It’s simple to cancel your UberEATS order. After you’ve placed your order, you can cancel it at any time from the order tracking screen on your app. Simply tap the “Cancel Order” button on your screen and end it before the restaurant begins preparing your meal. In order to apply for UberEATS, you must sign up by visiting the Uber.com website. Once you’ve signed up, make sure you set that you are available through the UberEATS app and then wait for a delivery request. You can determine if UberEATS is in your area by searching on the UberEATS website in the help section. As of now, UberEATS is available in over dozens of cities and in over 13 countries while still growing. You must be at least 19 years old to be an UberEATS driver. You must also have a valid license to become an employee. If you meet the requirements, you can work with your own hours. UberEATS is available 24 hours a day, seven days a week in most areas where the service is offered. You can only order from a restaurant during its opening hours though. The price of UberEATS varies based on several factors. UberEATS can become expensive based on the booking fee and delivery fee that you must pay alongside the food you’ve ordered, and the price can get even higher if you add the optional tip. The booking fee is a sliding pay rate based on what you order and how much you order from any given restaurant. The booking fee can be anywhere from $2 to $8 based on several factors, such as your location and the amount you’ve ordered. UberEATS drivers do get tips based on the quality of their service. Anyone who receives food from an UberEATS driver can tip them in-person with cash or tip them through the app within 7 days after receiving their food. DoorDash hires Dashers to deliver food to your home after you’ve made a purchase from their online platform. Once you’ve downloaded the app, you have access to several restaurants through which you can purchase food and have a Dasher deliver it to you. DoorDash constantly provides opportunities to people who want to be a Dasher and make deliveries for the company. Below we’ve answered questions on DoorDash and how a person can use the app or become a Dasher. DoorDash works by hiring its own drivers called Dashers. Dashers deliver food from a restaurant to a customer as soon as the customer makes an order. DoorDash charges between $5 to $8 to the customer for each order. DoorDash is a food delivery service where customers pay to receive their food from a delivery driver. Customers can order from any restaurant listed on DoorDash app if it is open. The average pay for a DoorDash order is $5 and any tip that is included in the order. DoorDash guarantees that its drivers will make at least $10/hour, which they pay the difference of if you don’t make that amount. DoorDash doesn’t deal in cash when it comes to any transactions. In order to pay to use the DoorDash service, you must make payments through the app. The only time cash is an option for DoorDash is when tipping your driver in person. DoorDash states that a driver can make upwards of $25 an hour. While that can be difficult for most drivers, DoorDash does guarantee a minimum of $10 an hour. If a driver doesn’t make $10 an hour, DoorDash pays the difference. DoorDash delivery is determined on the business hours of the restaurants they’re partnered with. In most instances, DoorDash makes deliveries at any time between 08:00 to 11:00 pm. These times change based on the restaurants opening and closing times in your area. DoorDash pays its drivers based on how much work they’ve completed between Monday – Sunday of the previous week. Payments are sent directly to the bank account of the driver through Direct Deposit and it usually takes around 2-3 days to appear. DoorDash does give you the opportunity to tip your delivery driver through the app. You can also tip the DoorDash driver when you’ve received your food. Tipping is optional, but DoorDash does suggest you do so. Many delivery drivers say that DoorDash is safe for them. 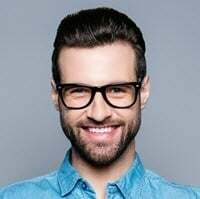 If a delivery driver does come across a situation where they feel safe or uncomfortable, it is suggested that they reach out to the DoorDash support team from a safe location. DoorDash charges you the price of the meal you’ve purchased alongside a delivery fee of $5.99. The fee can reach as high as $8 based on the distance of the location. You will also have to pay for taxes on your meal. Visit the DoorDash website and apply online. Once you’ve filled out your application, the DoorDash sales team will contact you if they need any more info. If you’ve been successfully listed, you can start receiving orders through the DoorDash app. DoorDash earns money through two distinct methods. DoorDash earns a commission every time an order is placed through the app. Another method in which DoorDash makes money is through marketing restaurants on the app. The time DoorDash stops delivering is based primarily on the city and the day. On average, DoorDash delivers as late as 11:00 pm. DoorDash can go as late as 12:00 am or even 12:30 am in some areas though. In order to work for DoorDash, you must be 18 years or older and have access to a vehicle. You should also have a valid driver’s license and current insurance. 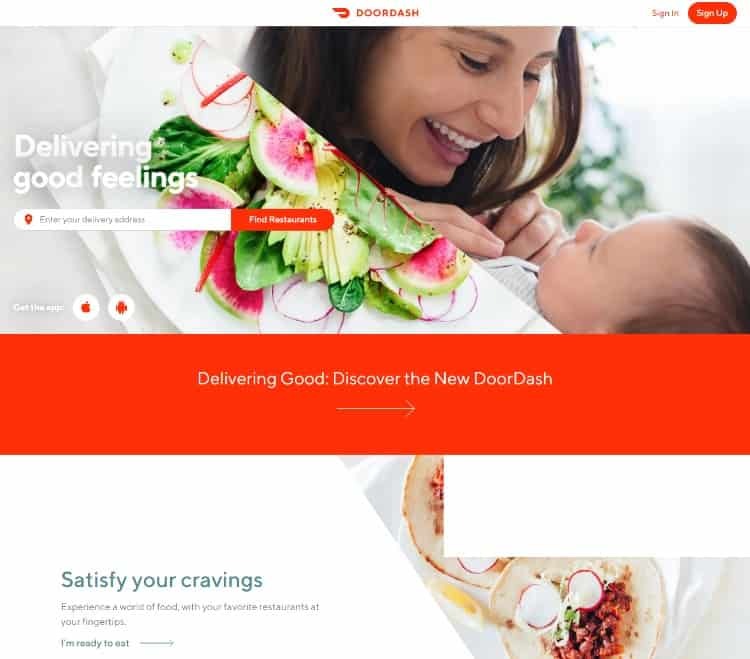 After getting the necessary materials, apply for DoorDash online through their website. To become a DoorDash driver you just have to apply online through the DoorDash site and download the app. You must be 18 years or older and must pass a background check in order to become a Dasher. At a minimum, DoorDash drivers get paid $10 an hour. DoorDash advertises that drivers can make upwards of $25 an hour, but it depends on location and demand for the service in that area. DoorDash is a legitimate company where people can make money by delivering food. Customers can also download the app and order food from nearby restaurants using the DoorDash service. DoorDash pays at the end of every week through Direct Deposit. It usually takes between 2-3 days for the payment to show in your bank account, which means DoorDash drivers receive payments by Wednesday night at the latest. It’s simple to use DoorDash. All you need to do is download the app and sign in. If you don’t have an account, create one. Once you’ve made your account, you can order from any of the available restaurants on the app and have a driver deliver it to you for a fee. Because DoorDash allows you to work whenever and however long you want, you can make a fulltime income by being a Dasher. It’s possible to make upwards of $25 an hour through DoorDash, but your income is entirely dependent on the number of hours you work and when. DoorDash asks customers to tip before the food has even arrived, which means Dashers can see the tip. When getting paid, DoorDash delivery drivers can also see how much they’ve received in tips. Dashers can also receive tips in cash and not through the app. You can deactivate your DoorDash account by submitting a deactivation request to the company. Fill out as much information as possible, such as providing your name, number, and email address, to have the address requested as quickly as possible. You can discover whether DoorDash delivers to you by visiting the DoorDash website and seeing where it is available. If you download the app, you can find out if DoorDash delivers to you by entering your address. DoorDash strongly suggests that you tip your driver just as you would any delivery driver from another service. You can tip your driver through the app or in person after you’ve received your food. The fastest way to get in contact with DoorDash is to call them. The DoorDash phone number is 855-973-1040. You can also email DoorDash or use their live chat service from within the app. Unlike many other food delivery service platforms, Postmates is available for many retail locations. Postmates isn’t just a service used for restaurants, but for groceries and alcohol as well. Not including a tip, Postmates is one of the highest paying platforms for couriers. Check out the questions we’ve answered about Postmates and how to use the service for your grocery and food delivery needs, as well as how to become a part of the Postmates Fleet. Postmates is one of the largest, on-demand delivery services available. You can receive food from restaurants, groceries, and even alcohol on-demand from any time and anywhere and have it sent right to your door. Postmates works through customers placing an order the Postmates app. Every order has a $5 delivery charge and 9% service charge, unless you are a Postmates’ merchant partner. After placing your order, a delivery driver will send you the items you requested. Tipping options are built into the Postmates app. When you’re making a purchase, Postmates encourages you to tip at least 20% of the total price of the purchase. You can even tip your courier in cash when they arrive. Postmates Fleet is the app used by Postmates couriers to become a delivery driver for the company. You can download the Postmates Fleet app after you’ve gone through the onboarding process for becoming a Postmates driver. Courier salaries for Postmates range from anywhere between $4 – $20 an hour. When including other things, such as bonuses and additional compensation, a Courier can make an average of $21,336 a year. To work for Postmates you need to visit the Postmates website and create an account. Once you’ve created an account, you will receive a welcome kit. After you’ve gone through the onboarding process, get the app, go online, and start accepting offers. Postmates couriers earn 80 percent of the delivery fee for orders, which start at $5 based on the distance. Postmates claims that experience couriers can make up to $25 an hour delivering by either car or bike. Postmates charges the cost for the order, along with $1.99 – $3.99 for Partner Merchants and $5.99 – $9.99 for other merchants. There is also a percentage-based service fee determined by the price of your items. Postmates pay weekly through direct deposit based on all deliveries completed in the previous week. Postmates pays its couriers at the end of the week and payments should appear in the couriers’ bank account by Thursday at the latest. Postmates is an American company that uses an online delivery app for customers that want to receive goods delivered to their door. Postmates allows people to order food, groceries, and alcohol through its app. Postmates is a legit company where you can work for them with a real job and it is not a scam. When working with Postmates, you are a contractor and not an employee, which means that certain things, like taxes, must be handled on your own. You can tip on Postmates through the app. There are three times you can make a tip, which is either prior to when your courier arrives, when the courier arrives through cash, or after the courier arrives through the app. To become a Postmates driver, you must become a Postmates fleet member. You need to be at least 18 years old and have a valid driver’s license with access to a bicycle or insured vehicle. Once you’ve been approved, you can start accepting orders. Postmates gives you several options to tip your driver based on the job they’ve done. Postmates suggest you tip at least 20% to your courier, but it is entirely optional. You can tip your courier either before or after they’ve made their delivery. Postmates gives you the opportunity to work at your own pace and set your own hours. If you’re in an area where the demand is high, you can make a fulltime income through working as a courier for Postmates. You can contact Postmates online by filling out a form on their website. If you need help as a Postmate or a Merchant or Partner, then you can do so by checking out the Fleet Help Center or Partner Help Center on their site. Postmates is available in over 70 U.S. cities and it shuttles practically anything from a store or restaurant to your door. If you want to find out whether Postmates deliver to you, you can visit the website and enter your address. Postmates is safe to use. After you place your order, you get confirmation when your Postmate delivery driver is on the way and you can monitor the status of your order from the app. Drivers that work for Postmates must go through a background check before being hired. Yes, in certain markets, Postmates delivers alcohol. You must be 21 years or older and the account owner to order alcohol. You also must be present to accept the delivery. Your Postmate may even take a picture of your ID, but it won’t get saved to their device. Postmates Unlimited is a subscription service where members get free delivery on any order from a merchant when the cart is over $15. Members orders are also accepted instantly. The cost for Postmates Unlimited is either $9.99 or $95.88. Postmates makes money on two fronts. The first method of earning revenue is through the delivery fee charged to its users. Postmates also earns revenue from commissions charged to retail stores for each order made through the app. Postmates is available in over 70 cities, across several states. 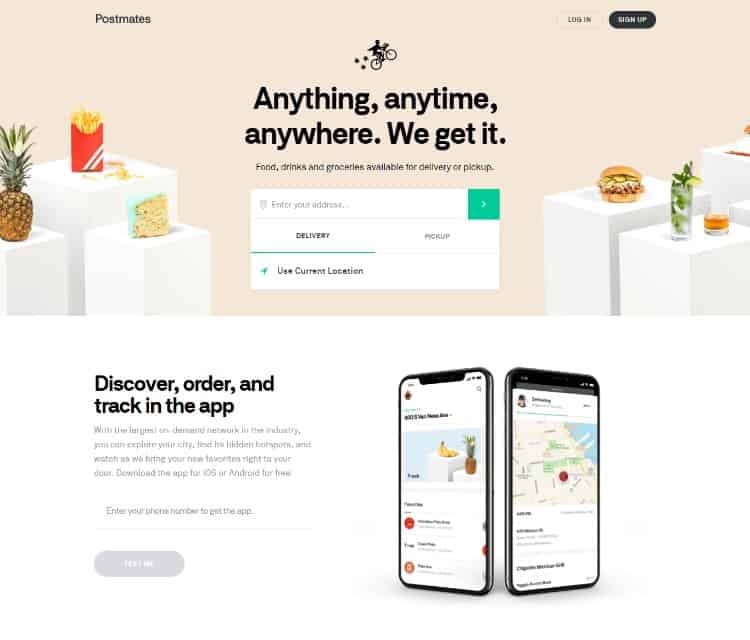 If you aren’t sure whether Postmates delivers to you, you can find a list on the Postmates website or enter your address on the website and see what services are offered in your area. Postmates does not supper cash only services. Postmates is completely cashless and you can only use the service through making payments on the app. Even tipping is suggested to be done through the app and not in cash. Postmates get paid weekly through direct deposit for every delivery completed within the week. Payments take around 2-3 days to appear, but you can withdraw your earnings ahead of time through instant deposit. Signing up for Postmates is simple, you can sign up on the website or download the app and sign up for the service on your phone. Make sure to get the Postmates Fleet app if you want to be a delivery driver.